More than one thousand years of preparation has brought Asphyxious closer than ever to his goal of rising above the other lich lords to stand as Toruk’s most invaluable general. He alone holds the key to unleashing the terrible might of the Nightmare Empire. To aid him in his great work, Asphyxious has applied his impressive mastery of thrall runes to craft Vociferon, a skarlock perfectly equipped to serve as a conduit for souls. Vociferon’s battle standard of death and discord resonates with unholy intent, for it was made to collect the essences of all who perish within its reach and fuel Asphyxious’ fell sorceries. 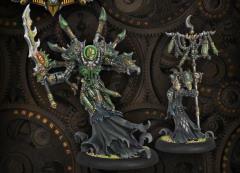 The Asphyxious the Hellbringer epic warcaster & Vociferon solo come in a blister (PIP 34095). A player may field one Asphyxious the Hellbringer & Vociferon in a Cryx army.